Not everyone wants to live in a shipping container for the sake of eco-efficiency. That’s why homes such as this half-prefab, half-custom — or prefab hybrid, if you will — might just be the solution for those still on the fence about prefab and modular architecture. This home, entitled The Wedge, was designed by Studio B Architecture and constructed by BuildSense for North Carolina couple, Scott and Vikki Metheny, and their two boys. Composed of three modular parts that were fabricated off-site in a factory and a main two-story living area that was built on-site, the home is a total of 1,829 square feet. On one side of the home, two of the three prefabricated containers are stacked — making up the children’s bedrooms on the upper level and the master bedroom on the lower level. On the other side, the third container houses the kitchen, laundry room, and bathroom. 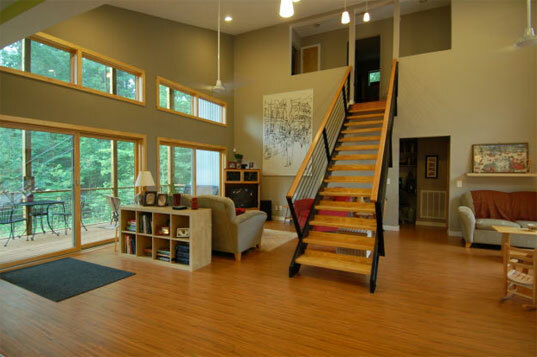 In the middle is an open and airy living area that was constructed on site. We are especially amused by the staircase in this living area– a strong diagonal form that appears as if it might retract into the second floor and take off at any moment. From the outside, a recessed entry into the home makes the delineation between prefab and custom clear, while also providing a front porch for the family to lounge. Opposite the entry is a separated back porch with floor-to-ceiling windows, creating a space where the Metheny family can still feel outdoors during cold winter months. 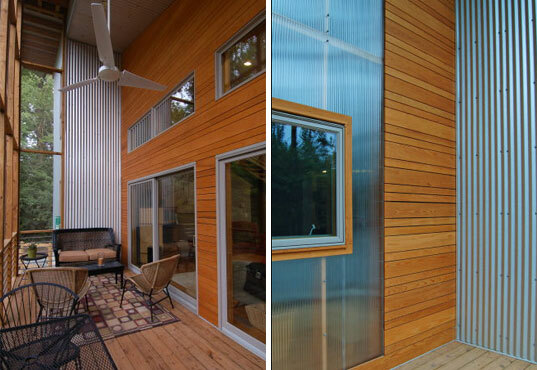 According to the home’s builders, BuildSense, the structure includes siding with a rainscreen that creates a building envelope that increases the energy efficiency of the home. The home also takes advantage of natural ventilation techniques and is sited to have optimal solar orientation. Materials used in this project exemplify the marriage between traditional home building and contemporary construction technology. The architects combined corrugated metal (for the industrial feel), cypress wood (for the secluded cabin feel), and translucent polygal (in order to see outside) into the home to create a modern, but not-to-modern aesthetic. Also I'm interested in other designs you might have similiar to the Wedge design. I need approximately 1800-2500 square feet. I'm very interested in the home called the Wedge. I'd like to know what the cost of that particular home is? Not everyone wants to live in a shipping container for the sake of eco-efficiency. That's why homes such as this half-prefab, half-custom -- or prefab hybrid, if you will -- might just be the solution for those still on the fence about prefab and modular architecture. This home, entitled The Wedge, was designed by Studio B Architecture and constructed by BuildSense for North Carolina couple, Scott and Vikki Metheny, and their two boys. Composed of three modular parts that were fabricated off-site in a factory and a main two-story living area that was built on-site, the home is a total of 1,829 square feet.